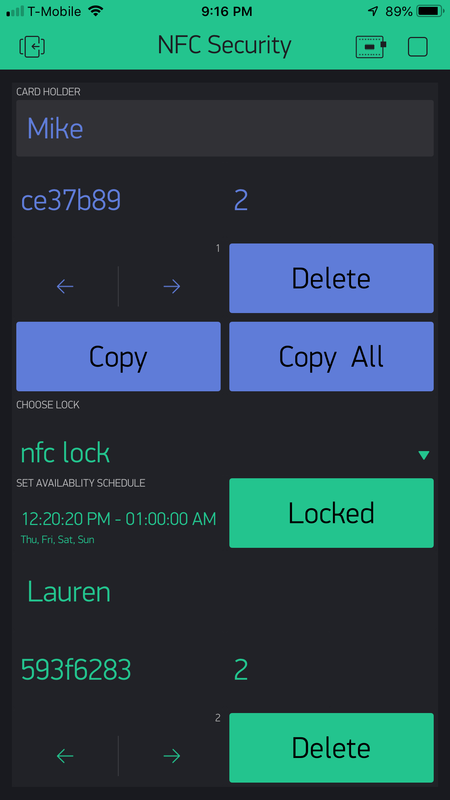 This is an ESP 8266 based project that uses NFC reader PN532 to secure and open doors. the code here is not current. Please use the code at github!! now tested with 4 scanners and multiple cards. also added OTA for updates and wifi / BLYNK provisioning. one for the lock and one for the master/scanner these are default values. I implemented it as a multi door system with a maximum of 500 cards per door. It could easily be upgraded to more cards per door. V5 current card index "vcount"
The Blynk Calls are in file 2. The data is handled in the third file. setupnfc();                                       // if hardware not found then start it now. Here is a very short video of the project in operation. You will see that the relay is active for 5 seconds after each time a card is read that is on the system. if a card is read on the master that is not stored in the system you can add the card to any door. cards can be moved to any door or removed. the activity is logged in the terminal. Nice for video and projects. Thank you. I’ve not studied your code, but from your description I guess that the system won’t work without your Wi-Fi and the Blynk server that you’re using being online? I have a somewhat simpler system which uses just one RFID tag code (because I want the unique tag that’s used to access your comm7nity swimming pool to also open our gate). My single code is hard-coded into my sketch, but Blynk can be used to release the gate remotely, and a Blynk table is used to store info about when the gate has been released and how. I get around the need to be online all the time by hard-coding my single RFID code I to my sketch (easy for me with gust one code) and using a non-blocking connection that will carry-on working if there’s no internet connection, and will try to re-connect periodically. Had I needed to use more codes then I’d probably have explored the idea of storing them in the SPIFFS memory of the NodeMCU, with an option to add/remove via Blynk. When I put my system together it worked perfectly on the bench, but went haywire when I connected it up to the gate release. My gate uses an AC release, which makes a buzzing noise for the 5 seconds that it’s avtivated. It turns-out that the issue was EMF feedback from the coil on the gate release, which I eventually solved with a capacitor across the sontacts of the relay. From memory, I think it was around 100uf. If you, or anyone else trying this project, has similar issues with an AC lock release then this tip might save you a bit of head scratching. The code has local storage that gets refreshed by the cloud on connect. It was working to open the locks offline but I have not checked it recently. I may have broken it in that regard. Recently I have purchased some chips that have persistent storage that work with little power over i2C buss. I will augment the cloud storage with this in the next version and make sure that it will work offline. Right now I am testing the locks on my home and hangar. So far so good. It is a fun hobby for me. I retired from software engineering a few years back and this is a revival for me. I was quite burned out. I am now in it mostly for fun. The things that drive me crazy are egomaniacs that think they are the sun and the moon. but I am good now at letting them think what they want and going my own way. I have a lot of ideas for new projects. Good to hear that you’re doing some hobby stuff for fun now. Many moons ago I was a professional photographer and when I changed careers it took me a long time to re-discover photography as a hobby. It can take quite a while to get out of the ‘working for the client’ mindset and starting to enjoy doing stuff for yourself instead. Sounds like you have another hobby too though, which I guess is where your username comes from? I love photography also. One of my passions. I don’t do portraits! The name comes from my involvement in Aviation. It is a life long love. but what did you expect in case the nodemcu crashes? do you have planned a nodemcu auto reset ? Today i completed adding FRAM storage for the backup data. I used the small FRAM from Adafruit. It works over the I2c buss. It was a fun addition it is now working. This week I am going to work on the enclosures. To this point there have been no problems with the locks. The testing has been without event. The locks have been up for two weeks now except when I update them. I have been leaving one online to see how long it will be before it goes offline. I have tested power cycles and network outages. Here is the code for the file storage on the FRAM. I used the Adafruit library but it was quit limited. so I wrote so additional bits to make it easy for myself to reuse. it still has some debug lines in my code as you will see. 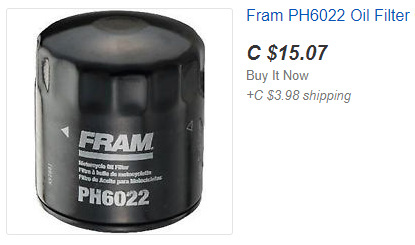 call startfram(); it will make sure the Ic2 address is valid and print “fram started” when the FRAM is ready. It is non blocking. It will continue to check the FRAM until it gets a valid address. then the code will just return without doing anything. It restores the data when it reconnects to the server. The data is also stored in FRAM. On startup the data is restored and the lock returns to function even if the cloud does not connect. Why not use the free 3MB of SPIFFS that most ESP8266’s have? it’s better to use nodemecu RAM SPIFFS. it’s a scam the 32k for $ 10 ! nodemecu is only 2.50$ with 4 Mb. The advantage of FRAM memory is that it has a life of around 10,000,000,000,000 read/write cycles, as opposed to 100,000 for the Winbond memory used by SPIFFS. 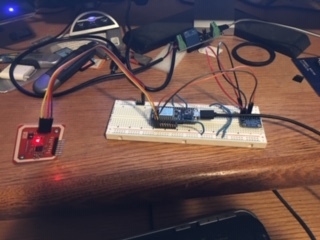 Obviously in this scenario, the number of times data needs to be written to SPIFFS is limited, as it only needs to be used to store a few RFID key tag numbers, and these won’t change very often, but it also has the advantage of not being overwritten when flashing your NodeMCU code if you don’t take care about which flash mode you use. For no good reason. I just like playing with hardware and software. It was an enjoyable exercise. You are right it is a bit expensive for the size of memory. The memory was made for things that need very rapid access to persistent storage and it is new. I am sure the cost will go down as it has for other storage media. I will explore using the internal memory. I purchased them in 2 sizes 8kb and 32kb. Yes this is a bit more than some options for data storage. For a house it does not change much but for a hotel it would change every day. Still 100,000 cycles would last quite some time. One big advantage is that it does not get erased on update.